Either way, both moments are connected to a key part of “An Old Start”: “Don’t tell Michael,” the former No. 1 rule of Escondite and the tie that binds the Bluths: Secrets are the Bluth-family business, and nobody has had more kept from him than Michael, the self-styled good son who, for all of his powers of observation, was blind to the dirty dealings that first landed his father in prison, has no idea that his twin sister has been in town for weeks at the very start of the series, and, in “An Old Start,” is shocked to learn that the family held on to the beach cottage they swore they sold after Tracey spent her dying days there. “Don’t tell Michael” shouldn’t just be emblazoned on shabby-chic home-away-from-home decor—they ought to put it on a crest. (Now that The Bluth-Austero Company owns a trophy store, maybe they can get one at a discount.) In that grand family tradition, “Don’t tell Michael” is one of the engines of the fifth season, the mysterious circumstances and apparent cover-up of Lucille II’s disappearance advancing the story as much, if not more, than Lindsay’s campaign. “An Old Start” winds its way down a few tangents, but it’s the smoothest episode of the season so far. It helps that the tangents are funny enough to justify their length: Dermot Mulroney is an excellent addition to the cast as silver-fox surfer (I feel a Fantastic Four joke coming on) Dusty, whose past-his-prime-’80s-beach-movie-villain vibe is catnip for Lucille, who’s the type of person who would’ve sided with the snobs in a snobs-versus-slobs comedy. And yet even a digression that introduces the concept of “breakfast wine” can’t touch the inspired lunacy that is Maeby’s full-bore descent into senior (not señor) living. The gray wig was not scam enough for the craftiest Bluth—and besides, it reminded her too much of her dad. So she’s adapted a whole new persona in the retirement community, posing as Lucille II’s sister and providing the missing woman’s business rival/father of her campaign manager (who’s probably in on the Lucille II conspiracy, too) with his very own escondite. It’s a deeply layered con, one that escalates Maeby’s habit of aging herself up while looping in George Michael’s fear of the elderly. But it also feels fresh and funny and new, due in large part to the way Alia Shawkat throws herself into her character’s alter ego. It’s the posture and the floppy hands and the effect that those giant choppers (2 Hour Teeth, or is that more of an Hour Mouth job?) have on the way she talks—cartoonish attributes that would fail to convince anyone in real life, but which seem like Academy Award-worthy work in comparison to Tobias and Murph’s tin-eared Bluth impersonations. Maeby made up Annette out of whole cloth, but her dad struggles to nail the simplest mannerisms of people he’s known for decades. Both great jokes; both good riffs on the Bluth family history of fraudulence. Every once in a while, you get a glimmer of genuine insight from Tobias, and in “An Old Start,” that comes from his take on Michael. And not just the “peanut pockets” bit: “This is the simplest character in the entire family. He has one personality trait: He always comes back.” A little heavy on the metacommentary, but partially true: It’s unlikely that Michael will ever leave Orange County for good, and he spends “An Old Start” circling back to old haunts, beginning with the Bluth-Austero Company offices, proceeding to the cottage, and then the model home—twice. 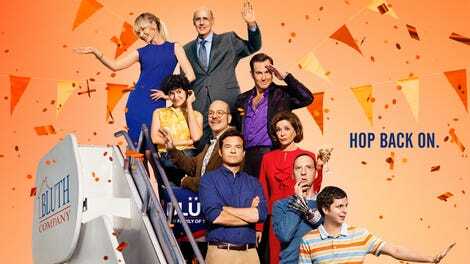 It can be a frustrating characteristic, and one that contributes to the sense that these Netflix seasons of Arrested Development just keep going around and around in circles. And it’s easy to see why Tobias would pin such a mundane distinction on Michael. He doesn’t get to wear goofy disguises or buy a whole store full of trophies—he’s the straight man. Even when he indulges a fantasy like the scuba expedition, he’s doing it for work. He can’t come back when he isn’t given the motivation go away. Keeping a secret like the cottage is a good place to start if the biggest lies of season five wind up involving Lucille II’s whereabouts. There’s been a lot of lying in this family—and a lot of love. But more lies, and they’re still piling up. If the Transparent joke in the season premiere feels off-puttingly glib in light of the Tambor sexual harassment scandal, the use of Shelly Pfefferman’s apartment complex as The Spotted Palm isn’t helping. Dusty’s great and all, but that wig on Mulroney is giving me flashbacks to the matted Halloween-store job that was on Chris Diamantopoulos’ head during the Marky Bark arc. Is Arrested Development going for intentionally bad hairpieces these days? Is this an extremely subtle Stan Sitwell joke? Type the URL for the Dad Fights/That’s What, Son spin-off Near Misters into your browser, and you’ll be taken, naturally, to Netflix. “An Old Start” introduces Adhir Kalyan as Bluth-Austero compliance officer named Adhir. He has to do whatever GOB complies. GOB is crying about trophies in an office where people used to get crowns. In that aforementioned web of callbacks: Tobias-as-George-Michael wears both a banana stand shirt and a Mock Trial With J. Reinhold hat; Maeby nixes the gray wig because it makes her look too much like Mrs. Featherbottom; Maeby attempts an encore of the Fünke family Thanksgiving miracle by luring a swan into the condo—which might be a nod toward the penthouse ostrich, too. I hope no one at Search thinks that the blue on the underwater map is land.